I. W. Gregorio’s novel chronicles the struggles teens can face growing up intersex through the eyes of character Kristin Lattimer. After homecoming, Kristin has relations with a fellow teen only to discover her worst nightmare: her body isn’t what she thought it was. 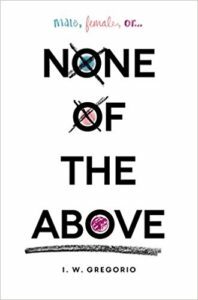 None of the Above is a story of discovery, bullying, and ultimately acceptance of ourselves and others. It also serves as a reminder to always be kind: you never know what someone else is going through. Do you love dogs? Christmas? Murder mysteries? Stop right there! Wagging Through the Snow, the latest installment of Laurien Berenson’s Melanie Travis series, is just what you’ve been looking for. Melanie is hoping for a quiet Christmas this year with her family and six dogs (five of them standard poodles, of course), but her family has other plans when her brother buys some cheap property for his joint business with Melanie’s ex-husband. 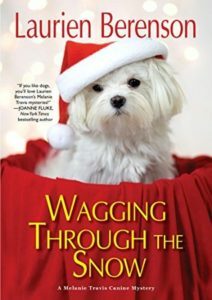 Reluctantly roped into helping out, Melanie discovers more than she bargained for: a cute little Maltese dog—and his dead owner under a tree. Find more Christmas mysteries at the library. 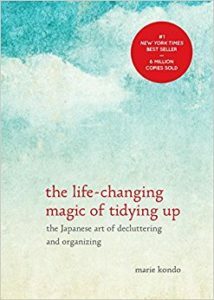 Find your inner clutter-free calm with The Life-Changing Magic of Tidying Up. All up-to-date on Marvel Netflix TV shows like Jessica Jones? Want to get into the comics but are too intimidated to dive in? 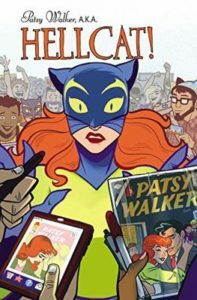 Get your toes wet with Patsy Walker, a.k.a. Hellcat! Volume 1: Hooked on a Feline. The canon is completely separate from the Netflix shows, but still super enjoyable nonetheless. It’s great to see a different side of Jessica’s bestie, Patsy, as well as meet more super friends! Kate Leth’s comic is ridiculously newcomer-friendly, lighthearted, and all around a good time. For people who do want to dive in further, when the comic refers to other issues, it provides you with the name and the number of the issue it is referencing! Easy peasy! The entire series is available now: check out volumes 2—Don’t Stop Me-Ow— and 3—Careless Whisker(s)— today. Go grab them, kitty-cat! Do you love vampires, werewolves, and faeries? 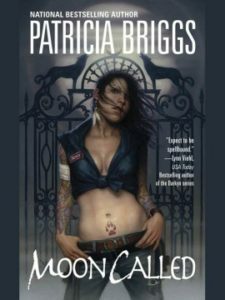 Then Patricia Briggs’ New York Times best-selling Mercy Thompson series is for you! It revolves around character Mercy Thompson, a mechanic who can shapeshift into a coyote at will. All she wants to do is fix Volkswagons in peace, but unfortunately, trouble has other plans. Start with Moon Called to dive into her exploits today! 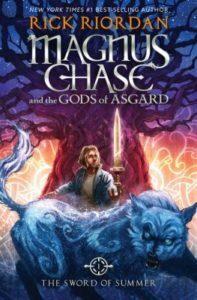 While author Rick Riordan’s focus is currently aimed at children/teenagers, that doesn’t mean they’re off limits for adults. If you’re a fan of action/adventure and different types of mythology, you’re in for a treat! The characters are well developed and have great senses of humor despite the trying circumstances. If you love Greek or Roman mythology, start with the Percy Jackson and the Olympians series (first book: The Lightning Thief). For Egyptian, give the Kane Chronicles a shot (first book: The Red Pyramid). Have a fix for Norse? Riordan has recently started on that with Magnus Chase and the Sword of Summer! In Nalini Singh’s Psy/Changeling series, there are three main classes of humans and humanoids that can intermarry and have children: humans, changelings, and the psy. Humans are well, human; pretty self-explanatory! The psy, like their name suggests, are psychic beings with different powers depending on the person. Some can predict the future or are empaths, while other still are insanely powerful telekinetics that can kill a person just by thinking about it. The changelings have nothing to do with the type in commonly known in mythology that steal children away in the night and replace them with their own. Actually, they are similar to were-creatures. The main two types that Singh’s series focuses on are wolf or leopard changelings but there are changelings of many animal types, no one is quite sure how many! Dive into this universe where the changelings, humans, and psy are on the brink of war with each other. only two changeling clans and a few rogue psy can help prevent disaster. Start with book 1 – Slave to Sensation. Wouldn’t it be weird if angels and vampires were a part of our daily life? Just try to picture angels launching off skyscrapers and gliding through the air with wings as many colors as you can imagine, their feathers softly floating down for a small child to add to her collection. For the characters of Nalini Singh’s Guild Hunter series, this is completely normal, average even! But what does a guild hunter do? The series namesake comes from humans who hunt down rogue vampires to protect ordinary citizens going about their day. The plot primarily revolves around the adventures of Elena, a guild hunter, and Raphael, the archangel in charge of North America. However, some books also branch out to develop other important characters without Elena and Raphael being the focus. This keeps the stories fresh and the overarching plot (that spans several books, though each individual book does have its own ending, no worries!) moving. If you love a good fast-paced paranormal romance with plenty of action, this is the series for you! Start with Angel’s Blood. Are you looking for something action packed to satisfy your fantasy fix? Give Joseph Delaney’s Revenge of the Witch a try! 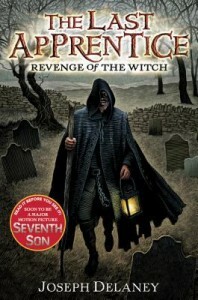 It is the first novel of his Last Apprentice series and doesn’t disappoint. Tom Ward is the seventh son of a seventh son which makes him exceedingly extraordinary. There are only a few others like him in the county and he’s about to be apprenticed to one that is older and wiser: Mr. Gregory, aka the Spook. Their special births causes Tom and other seventh sons to be able to see spirits and detect dark magic that normal people would have no idea is there. Need something to fulfill your Martin fix while waiting on The Winds of Winter? Try George R.R. Martin’s A Knight of the Seven Kingdoms! 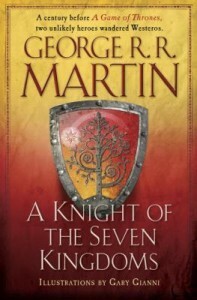 While it is grim like all of Martin’s A Song of Ice and Fire novels, it has a more lighthearted feel to it than the main series. It’s a compilation of three short stories that take place 90 years before the events in A Game of Thrones. They follow the adventures of Dunk and Egg as they traipse their way across the Seven Kingdoms, finding lords that require their services in exchange for money and housing.